I’ve been trying to concentrate on local fishing options and have some summer fun, but a trip to eastern Canada’s Gaspe Peninsula for Atlantic salmon is rapidly approaching, and I’m getting fired up about it, not that anyone who lives in Montana ought to be urging summer to end and fall to begin! But yesterday I was also looking at all the smoke in the Missoula Valley and hearing about afternoon stream closures on the Bitterroot, Clark Fork, Big Hole and Jefferson rivers, among others. I’m not sure that my nose and lungs can take two full months of wildfire smoke before fall rains extinguish the blazes. So, yesterday, I was daydreaming about travel and going through my Atlantic salmon flies, also deciding which reels and line combos to put together for my spey rods. I also checked out my e-mail, which included shots from Camp Bonaventure and Salmon Lodge, where anglers are catching some nice salmon this year. That’s where I’ll be in early September and it’s shots like the following image that make my head spin and I thought you might enjoy it, too. Don’t worry—I’m not done with trout yet. In fact, some of my favorite fishing of the year is coming up, meaning Tricos and hoppers, but I’m starting to feel the pull of the Gaspe, too. In the meantime, I’m going to get in some early morning fishing on the ‘root and other waters and take advantage of a Montana summer, despite the smoke and angling restrictions. Back at you with trout photos soon. 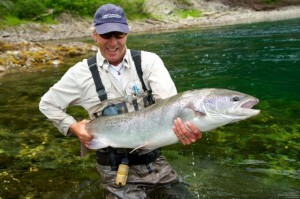 This entry was posted in CANADA, Spey, Travel and tagged Atlantic salmon, Bonaventure River, Fly Fishing for Atlantic Salmon, Gaspe Peninsula, Salmon Lodge. Bookmark the permalink. Looking forward to seeing you in a few weeks, we’lll keep a few big ones for you! Tie a 50-pounder off to a tree. See you soon.